When you are driving your car, an unexpected occurrence can play out at any moment. If you are alone in your vehicle, it might be difficult to grasp what to do – especially if you are in an emergency situation. There is a red, triangular-shaped button in every vehicle on the center dashboard, which activates your hazard lights. The signal is sent to certain lights in both the front and the back of your vehicle. The team at MyDriverLicenses.org has taken the time to explain exactly when you should use your hazard lights, or hazard flashers, below. However, keep in mind that hazard light laws vary by state, so if you are on a cross-country road trip, it is best to reserve use of your hazard lights only in case of emergency. If your car is broken down in the middle of the road, or if you are unable to move your car to the shoulder, you can turn on your hazard lights while you wait for help. If you have a roadside assistance service on the way, your hazards will alert the driver who is dispatched to exactly where you are. If you are broken down in the road, your hazards will serve to let the traffic know about your situation, and cars will be able to navigate around you without questioning why a car is stopped in the middle of the road. However, the team at MyDriverLicenses.org encourages all drivers to move their vehicles out of the road when a car breaks down. Try your best to ask kindly for help, and a Good Samaritan might assist with the task. When you find yourself in a situation where you need to fix something wrong with your car immediately, you can use your hazard lights. Again, this will alert drivers approaching your car that you are actively involved in something vehicle-related, and to avoid your car while you tend to the problem. According to the experts at MyDriverLicenses.org, the most common onsite car repair drivers perform while using their hazard lights is changing a flat tire. Just be sure to relocate your vehicle to a safe area if you are changing a flat tire or if you are performing maintenance on your car in an area with other vehicle traffic. 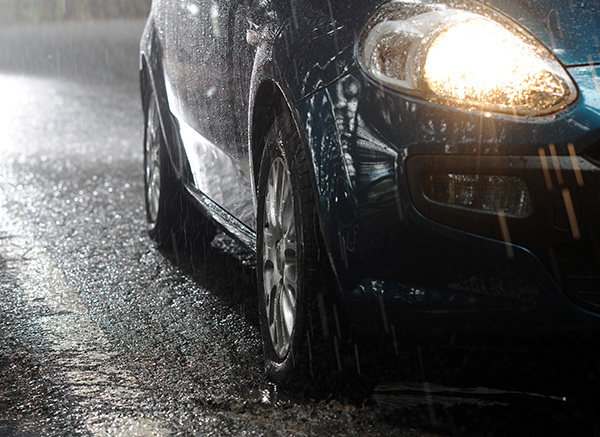 If you are worried that the driver behind you cannot see your vehicle in the pelting downpour or in a sudden intense snowstorm, use your hazards. Try to reserve this usage for very dangerous weather conditions, only. The thinking here is that harsh weather may make it difficult to spot other vehicles in front of you, so the hazard lights alert to the cars and trucks nearby in the case that you cannot see them or your depth perception has been compromised. For the most part, hazard lights in these situations allow other drivers to gauge where to stop and how fast – or slow – to drive. Since hazard lights are reserved for emergency situations (hence why they are called hazards), the team at MyDriverLicenses.org believes it is important for drivers to not misuse this function. Many drivers use their hazards as they see fit, and this is not encouraged behavior. For instance, you should never illegally park your car, so do not use your hazards when you do. If you need to double-park in front of a building and do not want your car towed or ticketed, it is in your best interest to request permission from a security guard, a parking attendant or a front desk receptionist that oversees the property. The experts at MyDriverLicenses.org also want to remind drivers to be mindful of pressing the hazard light button after use to deactivate the function when you are done tending to your situation. Oftentimes, drivers continue to cruise with their hazards on, which can be confusing to other drivers on the road.